Seasonic and HashFast Technologies announced that they have signed an agreement for Seasonic to produce power supplies for HashFast’s Bitcoin mining systems. Seasonic is one of the oldest and most reputable manufacturers of high performance PC power supply units, held in high regard by enthusiasts. Today, the company channels their products via their own retail brand but their designs can also be found behind many other brand names, as they also cooperate with many other companies as an OEM of high performance PSUs. HashFast on the other hand is a new company which has just been founded recently and is based in San Jose, California. HashFast currently plans to focus on the manufacture of Bitcoin ASICs. HashFast is particularly excited about the Seasonic partnership, given the PSU company's reputation in the industry. 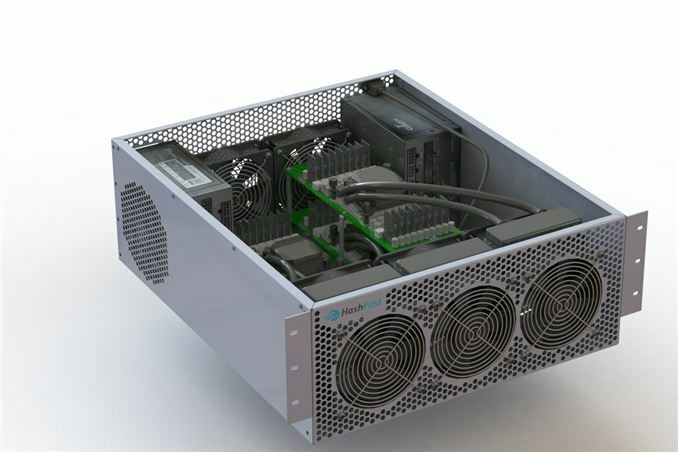 In order to accommodate what appears to be standard ATX form factor Seasonic PSUs, the rack mounted HashFast Sierra mining boxes now feature a 4U chassis. HashFast currently offers two mining systems: the tower form factor Baby Jet with a single ASIC, starts at $2250, while the multi-ASIC, rack-mountable Sierra starts at $6300. Both HashFast mining engines feature, aside from Seasonic power supplies of currently unknown specifications, liquid cooling solutions. They are expected to be available before Christmas. Although the higher efficiency of a power supply hardly makes sense in most applications, it is more than a logical choice for these high power Bitcoin miners, which will operate continuously under heavy stress. The savings from the cost of energy alone more than justify HashFast's choice, while quality is of paramount importance under such conditions. It's also a good move for Seasonic as seeking adjacent markets for its PSUs can help to somewhat reduce its dependence on PCs alone for sales. It is interesting to note that a virtual currency, Bitcoin, despite the many hiccups and the extremely volatile value, became popular enough to allow for the founding of companies solely focused on the creation of "super computers", designed specifically for mining. High monetary investments on a virtual currency however are extremely risky; individuals should tread lightly, lest this whole thing becomes a 21st century "gold rush". Apart from the fact that the virtual currency is extremely volatile and might lose its value at any time, the generation of a Bitcoin depends on the hashing power of your system(s) against the total hashing power available globally. As ASICs are being introduced into the hashing power of the community, not only they will spell the doom of common home computers but the output of every ASIC will diminish as more similar systems are entering the community. HashFast is one of a few companies founded this year and will be providing Bitcoin mining ASICs, therefore we expect hundreds if not thousands of such systems to be introduced into the Bitcoin community by the end of 2014. It remains to be seen if the investment of thousands of dollars on such systems is a viable economic investment, or if the massive processing power that will be introduced will make the generation of a Bitcoin a tedious, time consuming process, ultimately without a reasonable economic benefit; or, worse, result to a loss. HashFast does offer a Miner Protection Program for a large fee (nearly double the base cost of their mining hardware) to attempt to offset the risk, but it's still a risk. ... at least they'll still look pretty in a few years.
" individuals should trend lightly,"
lest this whole thing becomes a 21st century "gold rush"